“The ventilator alarms are going crazy!” This call by a frantic respiratory therapist summons clinicians to deal with a ventilator emergency at a CHEST (American College of Chest Physicians) course “Mechanical Ventilation: Advanced Critical Care Management,” co-chaired by Dr. Neil MacIntyre and John Davies both of Duke University Medical Center. 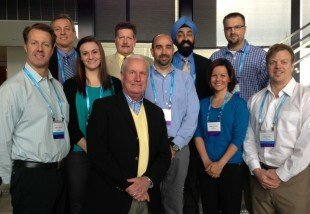 Dr. Neil MacIntyre (Duke University) with participants at CHEST workshop on Ventilator Emergencies. Amanda Dexter, IngMar Medical Clinical Education, on far right. Participants assessed patient history, ventilator waveforms, hemodynamic status (vital signs, x-rays, and ABGs), and conducted a physical exam of the patient (the RespiPatient® manikin) which included both bilateral and unilateral chest rise as well as breath sounds. Next the participants collaborated to create and implement a treatment plan for RespiPatient. Treatments administered included needle decompression, prescription of respiratory medication, airway management procedures, and adjustments to ventilator settings. RespiPatient is a high fidelity manikin which is part of the RespiSim® System for ventilator management training. The RespiSim System provides all of the tools necessary to realistically assess and treat ventilated patients in a hands-on, simulated environment. 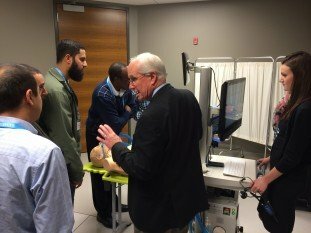 The course was held at Chest’s new Innovation, Simulation, and Training Center in Glenview, IL.